We're revolutionizing software testing for enterprise speed and quality. Only Sauce offers the speed, security, reliability and scalability demanded by the world’s largest development teams. Manage test resources and access control centrally from our console or via your CI server. 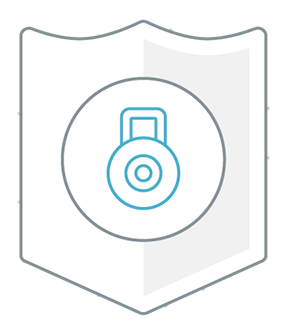 Test securely knowing that our security processes meet demanding standards. We offer the world’s largest platform for web and mobile app testing, with 800+ browser and operating system combinations, over 200 mobile emulators, and thousands of real devices, only Sauce provides the enterprise-grade security, scalability and reliability required to accelerate your testing. We run over 1.5 million tests a day and over 1.5 billion tests run to date, so we have the scale and reliability that enterprises rely on 24x7. Test native, hybrid and web based mobile apps across iOS and Android real devices and emulators and simulators on our public cloud or on dedicated devices in a private cloud - giving you complete control over devices along with the highest level of security. 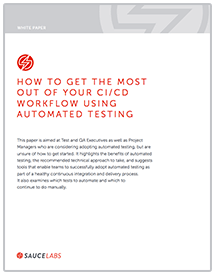 Run automated and manual tests without the burden of managing a device lab. We follow strict security practices and have a team of security experts who will work with you to meet your needs. And, we use only single-use VMs and thoroughly cleaned real devices so your data is never left behind for someone else to see and their data won't interfere with your tests. Dedicated data centers in the US and Europe allow for the maximum compliance with data policy regulations. Test Analytics provides real-time visibility into your tests across teams, platforms and applications. This improves your efficiency by quickly identifying bottlenecks and high-impact quality issues. 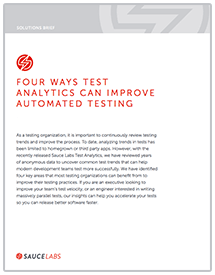 By highlighting tests that are slow and error-prone, Test Analytics helps identify what to fix first so you can ultimately release better software faster. With Extended Debugging we provide browser console logs and network calls so you can review browser performance and networking data to identify the root cause of test failures. Simply add the Extended Debugging command to your test and we generate the data quickly, using native browser tools (not test-slowing proxies) so you can see what took so long to respond. 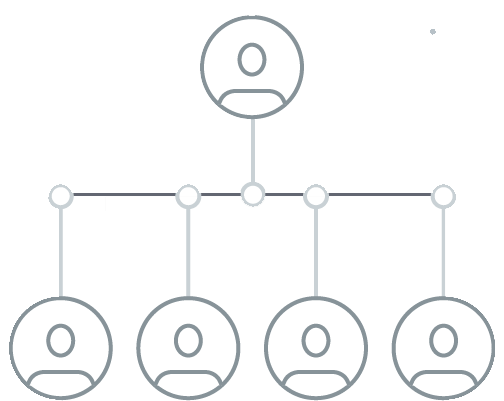 Extended Team Management lets you easily manage concurrent sessions (as well as mobile emulators and simulators), reporting and access across all your teams whether it's a few engineers or hundreds of groups across different geographies. Single Sign On (SSO) support means you can provision access without IT. Broad support for security providers makes this enterprise feature easy to configure. Support for Okta, Active Driectory, OneLogin and PingIdentity. Our API lets you extract all your test data so you can analyze test results with your quality dashboard and satisfy data retention requirements. Our CSMs are experts at getting you the right resources to help you get up to speed on Sauce Labs fast so your devs and QA folks can get the most out of their investment. Our training teams provide free and instructor led testing training on both Selenium and Appium frameworks. Beginning, intermediate, adavanced and custom courses are available. 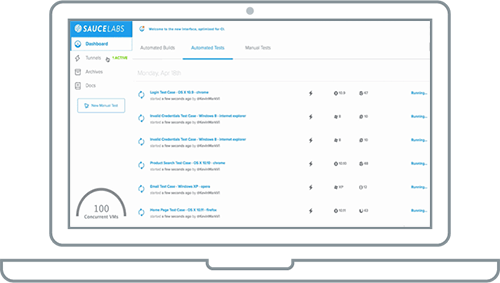 Start testing quickly with Sauce Labs' Professional Services to help your teams learn how to develop and automate tests or optimize your existing frameworks and tests. To reap the full benefits of DevOps, organizations must integrate software testing into their continuous delivery pipelines. 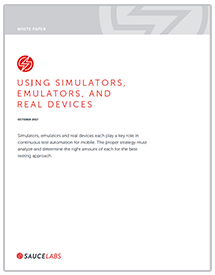 Learn about the fundamentals tool for testing mobile applications and where they fit into the test process.